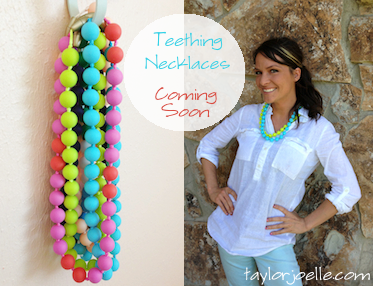 We are so excited to announce that Taylor Joelle is now offering TEETHING NECKLACES! Teething Necklaces are a great piece of fashion jewelry for mom to wear, and are a great teether for baby too! Taylor Joelle Teething Necklaces are 100% silicone beads (food grade silicone), soft for the baby’s gums, can be cleaned with dishsoap and water (or in the dishwasher). They have a breakaway clasp. They have no BPA, phthalates, cadmium, lead, or metals. There is knot tied between each bead to ensure that they do not fall off and there isn’t a chocking hazard. Necklace length is 18 inches. We are offering YOU a chance to WIN 2 of our teething necklaces! Must be 18 years old, open to residents of the US and Canada. Love these for my grandson!